with clients to address clinical social, physical and emotional development. Her background as a professional jazz vocalist, voice teacher and early education music instructor has led to many speaking engagements, teaching and supervision opportunities. 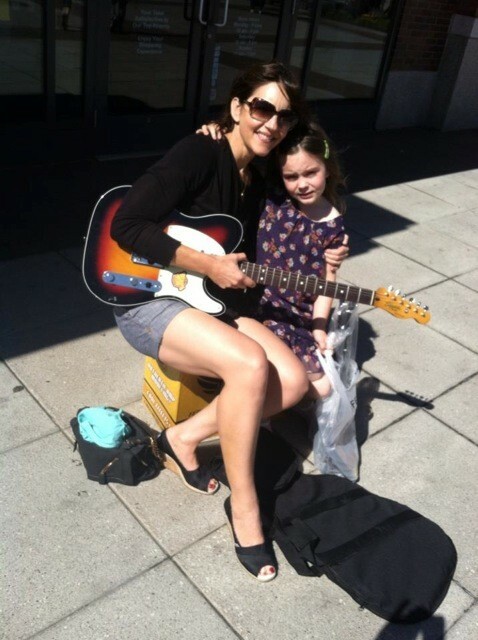 ESME’s Gina Zucker chats with Williams about maintaining a balance between a stable career and creativity, and the learning process of becoming a joyful Solo Mom. How had you envisioned your life before you married and had a child? After college, my goal was to live in New York, sing jazz, and have adventures. Marriage wasn’t really on my radar. You had a band called Cocktail Angst. Tell us a bit about that. My friend Jon Dryden and I started it in 1996. We are both from Santa Cruz and had played jazz together since we were fourteen. We share a brand of dry yet weird and sometimes dark but ultimately harmless sense of humor that I think is contained in Santa Cruz water. We wrote most of the first CD together, with me writing lyrics and coming up with melody lines and Jon writing and doing the arrangements. I was not a very good instrumental musician when I was younger. I sang and played percussion—and by percussion, I mean tambourine, vibraslap, and various shakers, including a plastic pineapple with beans in it. I am a way better instrumental musician as a music therapist because I was forced to learn and practice. But singing is my primary instrument. Why did you choose to pursue music therapy as a career? By the time I’d reached my late twenties, I’d accomplished what I’d set out to do, and I wanted more stability. I’m by nature a morning person so the nightly grind of getting dressed up and singing late on a stage was getting old. Once I had a gig at the Screening Room, singing jazz standards with a great trio up on a little balcony. There was a woman at the bar drinking a martini who looked really depressed. She was watching and listening more and more as our set went on. After the gig, she came up to me and told me that she had had a horrible day and was so depressed when she got there, but that the songs I sang and the way I sang them made her feel better . . . hopeful and happy, and she was going home not drunk and with a different perspective on her life. I thought, Wow. This is the part of singing for people that is the most important to me; how can I make this a day job? Those moments as a performer are fleeting. I wanted more of that and less of the stuff I didn’t enjoy. As a music therapist, I get to sing and play music all the time—I play more music than I did as a gigging musician. I have to play guitar, piano, percussion (including actual drums), and sing. I hope to learn my way around the bass this year and get better at ukulele. So I’ve found a career that gives me variety, security, and forced me to become a much better, well-rounded musician. But the process of becoming a music therapist was very emotional. There is a lot to explore in the connection between emotional/physical health and breath/voice. How did getting married and having a baby fit into all this? I realized in my thirties that I wanted a family. I envisioned my now ex-husband and me living in Park Slope, raising two children, both working and playing music, skipping around the neighborhood with Baby Bjorns, shopping at the Food Coop, going to fun parties, having date nights. Things didn’t work out quite as you’d planned. How do you maintain stability and sanity when you’re going through emotionally wrenching times? My marriage blew up when my daughter was about four months old. That’s really how it felt to me, like a bomb went off. Most of my energy was going to my baby, work, and trying to figure out what was going on. It was overwhelming. I so wanted to have my baby experience that was full of joy and hormones and talking about poop and breastfeeding and look how cute it is when they do this and that. I didn’t want it to be about me and my divorce and how hard a time I was having. I’m not sure how much I hid it. Probably not very well. Did you feel alienated from your community of married couples with kids? I had support from moms I was close to, but I also felt like such a loser. I hated that I had so much drama in my life. I was sad and angry and worried and confused. One time, a mom whose son I had worked with invited my daughter and me to a party at her beautiful brownstone. All these super-together couples were there—families I thought I’d be friends with, with my husband and child. I felt very set apart and people didn’t seem to know what to make of me. I felt a bit like the weird, nerdy kid at the party with the popular crowd. They were lovely, but in their presence, I felt the loss of the life I thought I was going to have. It hadn’t occurred to me that I might be a single mom. I had no Solo Mom role models, and I didn’t have many close friends who grew up with divorced parents. It took me a few years to adjust to this new role. I realized at this party that I needed to find a new tribe. I joined a single parents group, and I saw a post from a mom with a son the same age as Cleo looking for another single mom to have playdates with. She is now my best friend, and we have been basically raising our kids together since they were eighteen months old. No one else gets what I have been through and what I still go through more than her. I now have a boyfriend and so does my single mom friend. We have created our own version of family time. We get together with our kids and have barbecue and all that stuff. I recently went to her barbecue by myself. Cleo was with her dad and my boyfriend had other plans. There were families there who I don’t know quite as well, but I felt perfectly comfortable and fine. No one cares that I’m a single mom. I think people who know me just see how common it is for people to get divorced and accept me for who I am. How has your creative energy been affected by the changes you’ve gone through? There was a surge of creative openness as I went through the most emotionally difficult time of my divorce. I started gigging again when Cleo was about nine months old. I think I was singing really well then. As she’s gotten older and my music therapy career has taken off, I find my creative side is harder to maintain. The musician side of me, the songwriter, struggles to open up and be productive. I don’t have much room left. I work a lot and by the time I’ve worked, spent time with Cleo, and put her to bed, my fantasy of getting out my guitar and writing songs just doesn’t happen. I wonder if it’s something I can force with more discipline or if I just need to wait until Cleo is older. What are some things you’ve learned about yourself? I see where I can be controlling. I see where I can be unkind. I see that performing gave me validation without me having to be intimate with people. I have let go of a lot of my ideas about things being black and white. I’ve become more tolerant, but I’ve learned to trust my instincts. I place value on integrity, loyalty, and personal responsibility. Not everyone does and that doesn’t make me right and them wrong. My ex is a really good dad to Cleo. I appreciate all the qualities that I married him for, and I deal better with the ways in which he sees the world that I just don’t get. The thing about being a single parent, having gone through a bad divorce, is it’s all worth it in the end! Without that person, you wouldn’t have this particular amazing child. Cleo is hands down the best kid for me. I just totally dig her, and her dad and I can always share how much we both enjoy who she is even when we’re not getting along about other things. I’ve learned how strong I actually am. I think as a mom I’ve done a good job staying stable and being fun despite being under a lot of stress off and on. I don’t want to pat myself on the back too much. I’m just trying to do my best. This is still a work in progress for me.